For a journalist at a trade show, few things are more awkward than entering a room and finding that the exhibitor and his staff are the only people there: No dealers. No customers. Just a few desperate souls ready to pin their last half-hope on a man with a badgeand the badge says Press. 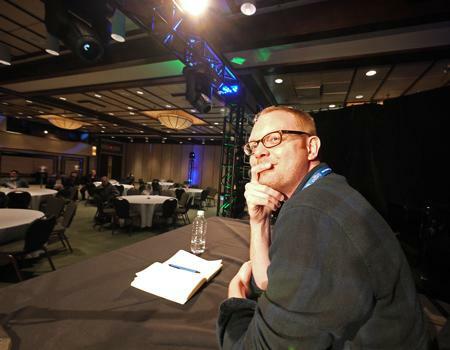 One of my favorite moments of SSI 2010 came during Saturday afternoon's outstanding "Ask the Editors" session, when a member of the audience asked the panel about audio nirvana. What components or systems, if any, had helped us achieve that elusive, mythical state when everything is perfect and right? I sat up straight in my seat and buried my fingernails into the palms of my hands, anxious to offer a response. When my turn to answer came, I stuttered, overwhelmed by the moment, but I think I said enough to communicate the idea that audio nirvana is a fleeting target, one that depends more on the listener's mood and ability to be moved and less on the system or individual components within any particular system. The lovely (as you can see) and talented (as anyone who heard her sing and play the flute at the SSI 2010 Give Band concerts can attest) Caroline St-Louis helped out at the show ticket desk. 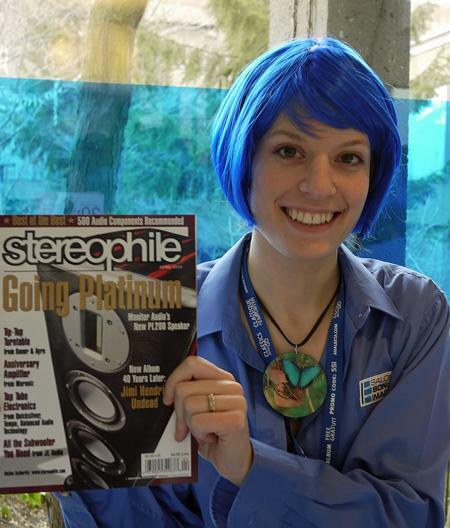 Here she is with her favorite audio magazine. 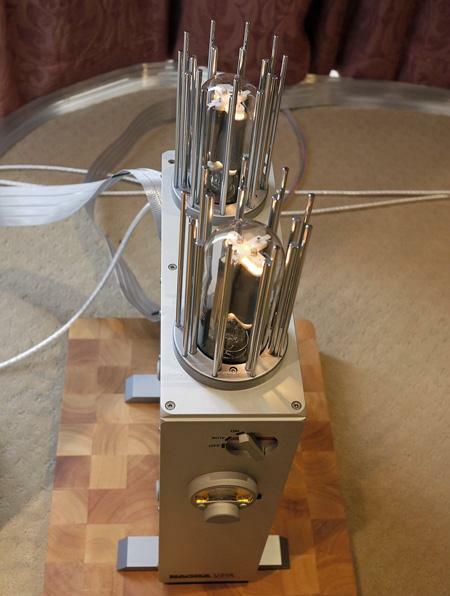 Take a dCS Scarlatti digital front end ($68,000), combine it with a pair of Nagra VPA tube amplifiers ($20,000/pair, pictured), and a pair of the new Verity Audio Amadis loudspeakers ($29,995) and you'll have a pretty good-sounding system, right? 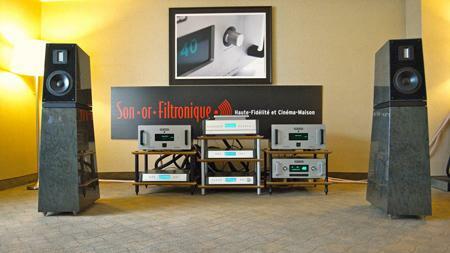 Son-or-Filtronique was celebrating its 41st year of being in business at SSI and the retailer's larger room featured Verity Sarasto Mk.2 speakers driven by Audio Research Reference 210 tube monoblockslove those green power metersand the relatively new Audio Research Reference Five preamplifier. 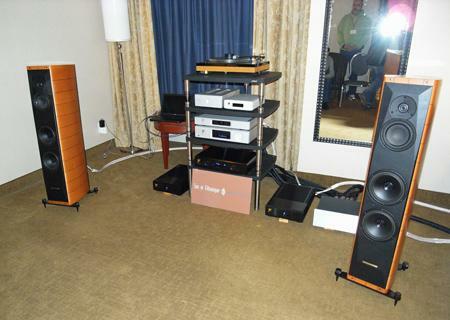 Source was the fully-loaded, four-box dCS Scarlatti SACD/CD player that Michael Fremer reviewed last August. (My apologies S-or-F, but I didn't note the cables being used.) This was the last room I visited at SSI and all my notes said was "Wow!" So that's all I have to say here. The smaller room operated by Montreal retailer Son-or-Filtronique was a little on the small side for the bass perfomance of the Sonus Faber speakers, driven by a pair of Ayre's mighty MX-R monoblocks, the midrange and highs were sweet and musical -sounding, whether the source was the MacBook seen in the photo driving the Ayre QB-9 USB DAC or the acrylic-plattered Bauer dps turntable that Art Dudley favorably reviewed in the Show (April) issue of Stereophile. The affordable Monitor Audio Silver RS6 has been a long-term recommended loudspeaker at this magazine since Bob Reina reviewed it in March 2006. The English manufacturer recently replaced its "S" series with "X" models, which feature revised drive-units, better internal bracing, and lacquer finishes. 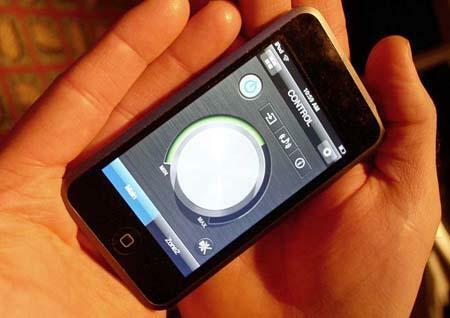 The benefits of the changes are said to be better low-frequency definition and deeper bass extension. Being demmed at SSI was not the replacement for the RS6 but the larger Silver RX8 ($1750/pair in standard finsih, $2000/pair in black or white gloss). 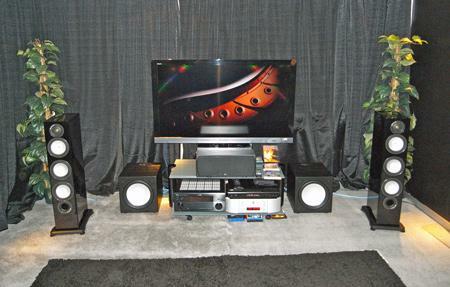 With the RX8s driven by a Simaudio Supernova CD player and a Yamaha RXZ-7 receiver, Dave Brubeck's classic "Take Five" did indeed sound fine, with a soundstage that floated free of the speakers themselves and weighty but well-defined lows. 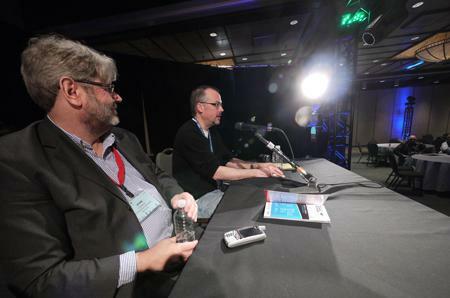 The Stereophile Ask the Editors session at Showsin which John Atkinson (left), Art Dudley (center), Stephen Mejias, and I fielded questions from the audience at SSIin something that I enjoy a lot, and so, I know, do JA, AD, and SM. Through the years, I've learned that it's almost impossible to anticipate what the questions will deal with. And that was certainly true this time. The questions covered a wide range of topics: why are there so few active speakers on the market; why doesn't Stereophile review more vintage equipment; what system that we've heard (at the show or elsewhere) represents to us audiophile nirvana; music recorded in what format will be reproducible a thousand years from now; why is the interest in high quality audio less popular now than it was a few decades ago; has loudspeaker quality improved through the years; and many more. All thoughtful, interesting questions. 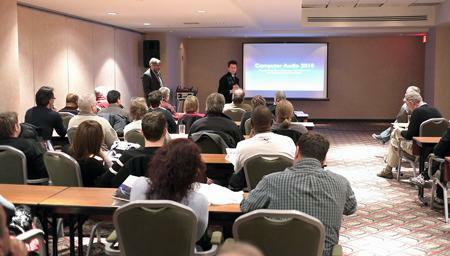 The Computer Audio 2010 seminar on Saturday was very well-attendedI barely managed to get a seat. 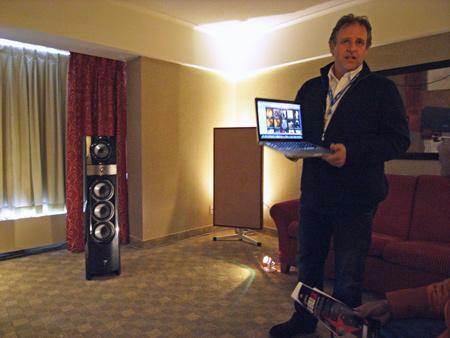 The presentation was by Steve Silberman of Ayre Acoustics, with technical commentary by John Atkinson. Silberman took an admirably generic and non-partisan approach, barely mentioning Ayre products, and refusing to answer the question "Should I get a Mac or a PC?" I've taken a wait-and-see approach to the whole computer audio subject, and Silberman did not convince me it's time to introduce a computer into my audio system, but I must say that he did an excellent job of describing the options, and if I were to take the plunge I would certainly use the information on the Ayre web site. Although it was introduced at the January CES, SSI was my first opportunity to hear Wadia's cute 151PowerDAC mini amplifier ($1200). 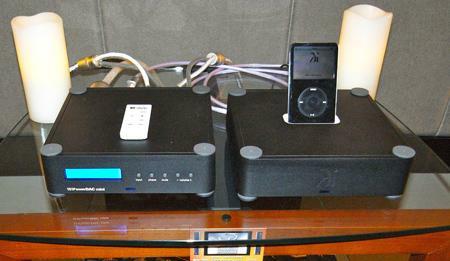 It combines a DAC, digital preamp and 25 Wpc power amp, and is housed in the same tiny package as Wadia's iTransport shown to its right. The PowerDAC was being used to drive ProAc's new floorstanding Studio 140 Mk..II speakers in the M-HiFi room at SSI, with XLO cables. Cable manufacturer JPS Labs is now connected (sorry) with the Canadian importer AudioScape Canada, which also distributes amplifiers and CD players from PrimaLuna, turntables from Dual, loudspeakers from Usher, and other delights. 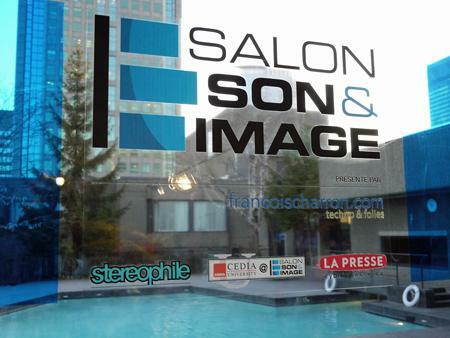 At Salon Son et Image, Joe Skubinski of JPS unveiled a new version of his popular Digital AC power cord, now called Digital AC-X. 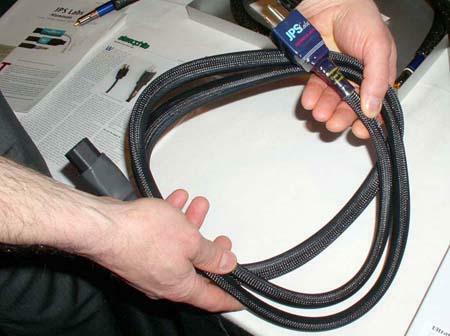 The cable's filter network has now been upgraded to handle higher frequencies than before, but the price remains the same: $399 for a 2-meter run. Sweet! 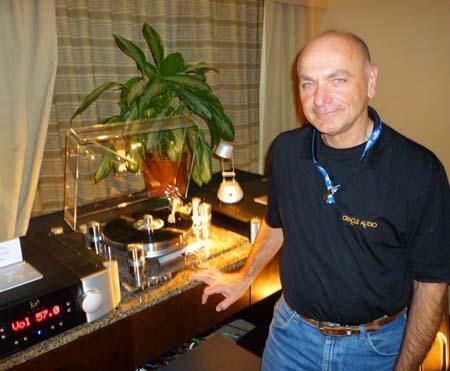 In one of the excellent-sounding Audio d’occasion rooms, I had the pleasure of meeting Oracle Audio Technologies’ Jacques Riendeau, who introduced me to the latest incarnation of his beautiful Delphi turntable, reviewed by Michael Fremer in our March 2010 issue. Riendeau explained that the Delphi Mk.VI ($11,600, with Oracle/SME 345 tonearm) uses Delrin feet for a better balanced sound across a wider environment; an improved main bearing system for a greater gap between background noise and the signal; and, most importantly, Oracle’s Micro Vibration Stabilizer System, which utilizes three plungers that dip into silicone baths to reduce lateral vibrations, found by Riendeau to have an enormous impact on sound quality. The dudes at Coup de Foudre know great music, and that’s exactly what was playing when I walked into one of their rooms on Saturday afternoon, Tom Waits sounding all damned and heartbroken but still so full of love, and there was nothing I could possibly do but sit down and listen. The soundstage was so deep, the low-level resolution so clear, the overall presentation so effortless, it was as if I was looking into Tom Waits’ old soul.